Lack of financial resources is stopping 53% of working Australians from living their dreams, according to new research published in the Suncorp ‘Living The Dream’ report. The study investigated Australian attitudes towards ideal lifestyle and life goals, including expectations relating to retirement. Nearly 80% of those surveyed said they were living or partially living their dreams, but many blamed lack of financial resources and lack of opportunity for failing to actively pursue some dreams. 37% said they had given up on parts of their life dreams. 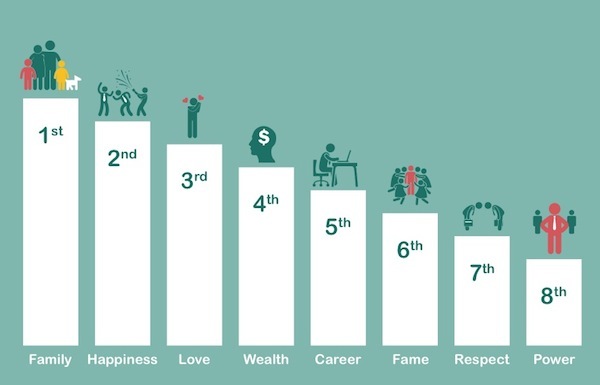 One in 10 claimed to have no life goals, dreams or plans. Immediate lifestyle and family goals took precedence for most ahead of career and long-term financial goals. Generation Y was found to be the most optimistic towards retirement, with 22% claiming they aimed to retire before age 55. The 2014 Federal Budget resetting the retirement age to 70 will impact the expectations of more than two-thirds of Australians, who planned to retire before then. 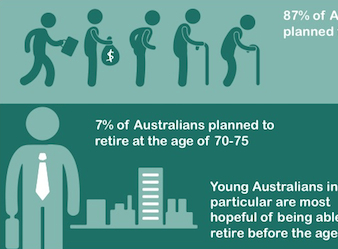 “Only 7% of Australians planned to retire at the age of 70 to 75,” the report said. Despite generational differences, across the board women planned to retire at a younger age than men. 66% of Australians said they were actively planning for retirement, with older generations more focused on this than younger people. 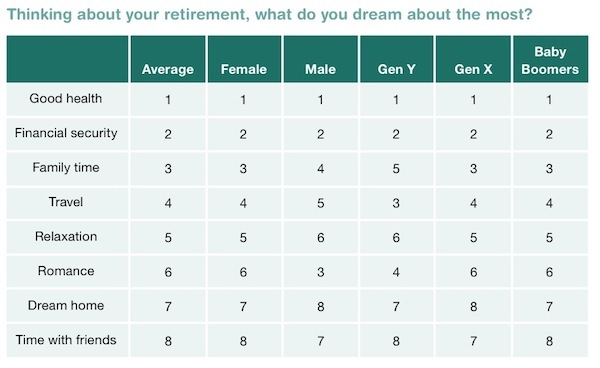 55% of men and 53% of women felt confident they could fund their retirement dreams. Generations X and Y were living in the moment, claiming to not think about retirement. But the main reason Baby Boomers were not planning their retirement was a lack of understanding about superannuation. “These results reflect a need for further education about retirement and the benefits of planning and saving for retirement from a young age,” Suncorp said in the report. 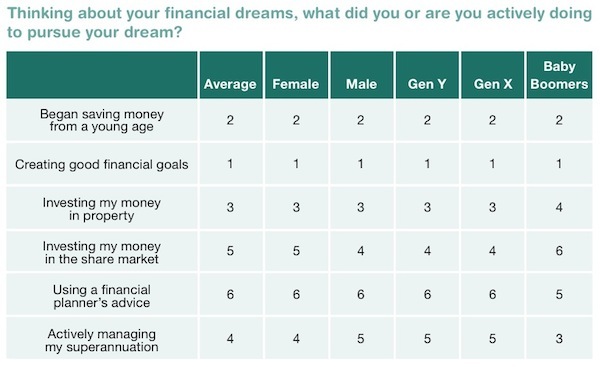 Regarding tactics to pursue financial goals, consulting a financial advisor ranked last across all generations. ‘Creating good financial goals’, saving from a young age and investing in property were the top three ways to achieve financial dreams. Men were found to be more likely than women to invest in the share market and actively manage their superannuation. When making career choices, only 17% of Australians considered which path would lead to financial security. Priorities were instead placed on their interests (42%) and skills (21%). Suncorp’s conclusion to the report was that Australians need to engage with their superannuation. “It is concerning that super and financial advice features so low in priority for Australians given the financial upside these factors could have on lifestyle dreams. “Australians need to start saving from a younger age, planning well ahead and thinking about their finances earlier, it is never too late to start improving your financial situation,” Suncorp said in the report.